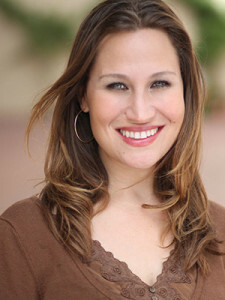 Pamela Brode grew up in the United Synagogue Youth. Between 7th and 12th grade she attended nearly every chapter/regional event for which she was eligible and spent her summers at Camp Young Judaea, Zionist summer camp. Her freshman year of college was spent exploring all aspects of our Jewish homeland on Young Judaea’s Year Course. These experiences provided Pamela with a deep appreciation and love for Judaism and Israel. Pursuing her passion for theater, Pamela attended the prestigous American Musical and Dramatic Academy in New York City where she developed her skills as a performer. During this time, her love for improvisational comedy grew when was cast in an improv team that performed throughout the city. Returning to Southern Califorina, she later studied and performed at the infamous Groundlings Theater, taking to the stage with various plays and Improv shows. Drawing on her years of experience in both the Jewish and theatrical communities Pamela has worked with children of all ages for over 20 years – from camp counsler, to teacher, and now youth director for USY. She sees her position as an opportunity to give back to the great movement that helped her form her personal identity in her own childhood years ago.